A genuine Rhode Island chicken. Image courtesy of eschipul @ flickr. All over Rhode Island, people want to keep backyard chickens. The trouble is that the law often doesn’t let them. 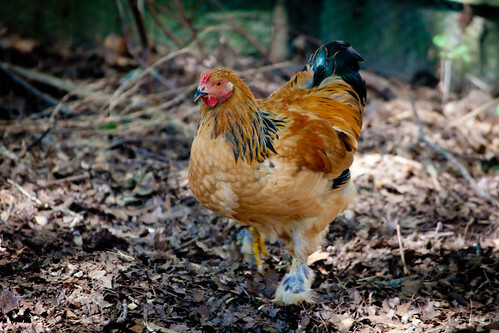 Until 2010, Providence banned chicken-keeping entirely. That year, a coalition of residents worked together to overturn the ban. These efforts paid off – now, chickens peck away happily at sites ranging from Southside Community Land Trust’s almost-a-whole-block City Farm to my friends’ snug 1700-square-foot lot in the West End. After this success in Providence, other cities and towns looked more closely at allowing chickens. Swanky Barrington followed Providence. The City Council in Cranston, where I live, repealed the city’s chicken ban; unfortunately, though, our mayor vetoed the repeal so the ban remains on the books (for now). As spring approaches and our thoughts turn to our backyards, a city and town in northern Rhode Island – Woonsocket and North Smithfield – are considering lifting their backyard chicken bans. The effort to repeal the Woonsocket ban began the same way most repeal campaigns seem to: a Woonsocket zoning officer ordered a responsible chicken owner to get rid of his birds. Alex Kithes says his neighbors didn’t even realize he had chickens until he offered to share some eggs. As word spread, the city found out and issued a citation. Alex is fighting back. He has drafted a city council member to introduce a bill allowing chickens in Woonsocket, and he is lining up individuals and organizations to lend support. CLF supports eliminating barriers to local food, and that includes legalizing backyard chickens in Woonsocket. When people keep chickens, they can cheaply opt out of industrial egg-suppliers. A more direct benefit of backyard chickens is that small broods’ droppings make great fertilizer, while concentrated droppings from large egg-laying operations are toxic. Backyard chickens also add resiliency to our increasingly concentrated food system. And backyard chickens can even encourage organic waste diversion, eating table scraps that otherwise might be landfilled. These are the types of broad-ranging benefits that panelists recently promoted at the Rhode Island Local Food Forum. Legalizing backyard chickens also allows residents full use of their property to grow food and helps to foster community. To better understand these points, we have to take a brief look back in history. Municipal bans on backyard chickens began with New York City in 1877, followed by Boston in 1896. Both cities were motivated primarily by concerns with unsanitary chicken slaughter; wholesale bans on chickens, however, were much easier to enforce than targeted bans on slaughter. Over time, however, slaughter of backyard chickens has all but vanished (and is still banned in most modern chicken ordinances, though off-site processors may be available for those who want to eat their birds and not just their eggs). Sanitary concerns have largely disappeared (and sanitation is regulated in most modern chicken ordinances). And chicken bans remain on the books primarily due to worries about nuisance and image. But any well-tailored chicken ordinance will take a dual approach to nuisance: both proactive (setting minimum conditions for housing and feeding chickens, and banning noisy roosters) and reactive (allowing neighbors or municipalities to fight actual nuisance conditions). This approach allows people to keep clean, quiet birds on their property if they choose to do so. And clean, quiet birds not only are perfectly consistent with a positive community image but can in fact foster community. Backyard chickens can be quite stylish (this coop, for example, looks even better in person!) or even all but invisible – I didn’t realize my West End friends had chickens until they paused our daughters’ play date to go outside and feed the birds. Chickens tend to be great with children, and egg-sharing can bring neighbors together. Finally, there are no known data suggesting that backyard chickens negatively affect nearby property values. The fact is that out-and-out chicken bans restrict property rights and prevent environmental benefits for no good reason at all. Everybody loses. For all these reasons, CLF supports amending the Woonsocket backyard chicken ban. I plan to speak in favor of repealing the ban at Woonsocket’s April 1 City Council meeting, and I hope you will consider joining the growing pro-chicken coalition as well.